This Highlands Country Club home for sale, located at 230 Hummingbird Lane, is a must-see! This outstanding home is is one of the most charming homes on the plateau. Expansive views of the golf course and a stunning setting are provided by this Highlands NC property. Walk to the workout center from this ideal location and enjoy the best of what the Highlands Country Club has to offer. This four bedroom Highlands NC home for sale features a spacious and bright living room, a wonderful upscale kitchen, and a cheerful solarium. The screened porch offers views of the expansive garden areas, a perfect place to enjoy. French doors open to the decks and terraces from every room. The property extends to the edge of the lake, a picturesque spot for a canoe ride or fishing. One of the greatest aspects of this Highlands NC home is that almost the entire house is on the main level. This easy living layout includes a spacious master suite complete with a sitting room and separate His and Hers bath areas each with its own walk-in closet. Each of the remaining three bedrooms has its own private bath. The home has plenty of storage and a garage for a golf cart and car. Contact our team at Berkshire Hathaway HomeServices Meadows Mountain Realty today to learn more about Highlands NC real estate. We welcome the opportunity to help you conduct a successful property search. 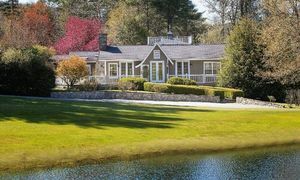 Let our knowledge and experience find you the ideal home, whether it is this Highlands Country Club home for sale or another home currently available.